By NCTA Dean Ron Rosati, Ph.D.
We ended last week with warnings from the National Weather Service telling us to expect severe winter weather over the weekend. At an agricultural college like the Nebraska College of Technical Agriculture winter storms are concerns which capture our attention. Many students have responsibilities for livestock care either on campus or at private facilities in the area. Severe winter weather means it will take extra time to feed the livestock, check for frozen waterers, and be sure the heat lamps are on for baby lambs or other newborns. Our NCTA cow herd will be calving in the spring so there are no newborns in the herd at this time of year. Cows are grazing on crop resident of corn stalks and were fine. When a storm is threatening, college employees work with students to help them learn how to prepare for Nebraska’s weather, both for their personal safety and that of animals and livestock. Aggie students are reminded that travel will be difficult during a pending storm so they should plan to avoid driving very far from Curtis for a few days. If they need winter gear, feed supplies, or personal items in preparation for being at campus or homebound in town, they are coached to secure those supplies prior to the arrival of severe weather. In agriculture, we find sometimes feeding equipment does not work quite as well when the temperature drops. Some of our Aggie students from farming or ranching enterprises already know this. And, others are learning the importance of plugging in engine heaters for diesel tractors and skid steer loaders the night before a storm is expected. The same preparation holds for the pickup trucks that students use to get to livestock facilities. NCTA has a special parking lot with numerous electrical outlets where students can keep their diesels pickups warm overnight. Most are also four-wheel-drive which is valuable at times like this. Our farm staff work with students to help them understand the importance of having plenty of feed and supplies stored on campus long before severe winter weather hits. Students without an in-depth agricultural background learn the value of self-reliance while living and working in remote or rural locations. When hit by severe weather, rural residents may experience multiple days before the county roads or highways are cleared sufficiently for travel and restocking agricultural supplies. NCTA follows the same practices with our residence halls – keeping enough food in storage so that we can keep the campus fed during winter emergencies. We’ve also allocated some housing on campus for staff use during emergencies so that critical personnel can remain here to care for students. Students and employees, alike, generally appreciate the challenge presented by winter storms. They learn the value of warm boots, insulated coveralls, headgear, and a good pair of work gloves. They appreciate the lack of stable flies biting the ears of their horses. Some are glad they no longer need to perform mowing chores. They can enjoy getting outdoors and exercising their stock dogs, pets or horses boarded near campus. Our NCTA Ranch Horse Team with eight students and Coach Joanna Hergenreder had traveled to Fort Collins, Colorado on Friday before the storm for the Winter Fest Stock Horse competition. They were able to return safely to campus on Sunday evening, with some outstanding results for their final contest of the season. Overall, while some areas of the state received 10-14 inches of snowfall and schools were closed on Monday, storm conditions turned out to be relatively mild in Frontier County. NCTA staff worked over the weekend and cleared streets, sidewalks and campus parking lots. By Monday, most campus and community streets and sidewalks were cleared and dry. If they resided on campus or in town, Aggie students had no problem getting to class for their last week before final exams December 10-13. 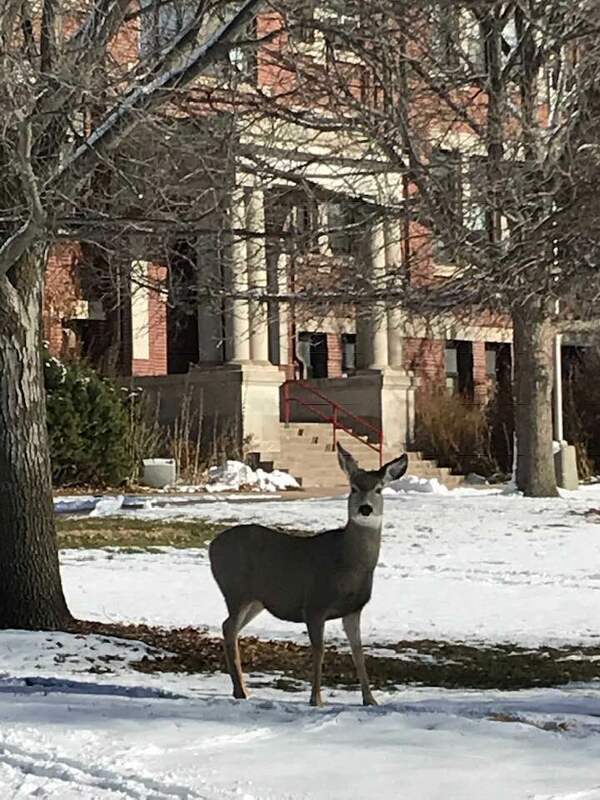 We appreciate ALL of the extra efforts made by campus, community and county personnel in keeping this University of Nebraska institution, its students and livestock safe, fed, protected and prepared for this final month of 2018! NCTA Mission: The Nebraska College of Technical Agriculture is devoted to a statewide mission of preparing students for successful careers in agriculture, veterinary technology, food and related industries. The college provides open access to innovative technical education resulting in associate degrees, certificates, diplomas and other credentials. 6 – Curtis Hometown Christmas, 4-6 p.m.